Monastic Orders in England outlined with pictures. Read Chapter Eleven as html (below). Transcribed from Chapter Eleven, F.A. Gasquet's English Monastic Life. For even more information about abbeys, monks and religios Orders, see my abbey bookmark pages. by Richenda Fairhurst, historyfish.net. July 2007. 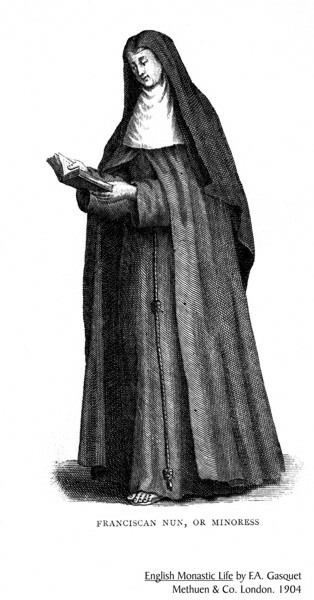 Gasquet, F. A., English Monastic Life, Methuen & Co., London. 1904. Chapter Eleven. The various Orders existing in England in pre-Reformation days may be classified under four headings (1) Monks, (2) Canons Regular, (3) Military Orders, and (4) Friars. As regards the nuns, most of the houses were affiliated to one or other of the above-named Orders. till it quickly superseded any others then in existence. Owing to its broad and elastic character, and hardly less, probably, to the fact that adopting it did not imply the joining of any stereotyped form of Order, monasteries could, and in fact did, embrace this code without entirely breaking with their past traditions. This, side by side in the same religious house, we find that the rule of St. Columba was observed with that of St. Benedict until the greater practical sense of the latter code superseded the more rigid legislation of the former. Within a comparatively short time from the death of St. Benedict in A.D. 543, the Benedictine became the recognised form of Western regular life. To this end the action of Pope St. Gregory the Great and his high approval of St. Benedict's Rule greatly conduced. In his opinion it manifested no common wisdom in its provisions, which were dictated by a marvellous insight into human nature and by a knowledge of the best possible conditions for attaining the end of all monastic life, the perfect love of God and of man. Whilst not in any way lax in its provisions, it did not prescribe an asceticism which could be practiced only by the few ; whist the most ample powers were given to the superior to adapt the regulation to all circumstance of time and places ; thus making it applicable to every form of the higher Christian life, from the secluded cloister to that for which St. Gregory specially used those trained under it : the evangelisation of far-distant countries. <>the monks took refuge in Rome, and were placed in the Lateran, and by St. Gregory in the church he founded the honour of St. Andrew, in his ancestral home on the Coelian Hill. It was the prior of St. Andrew's whom he sent to convert England. 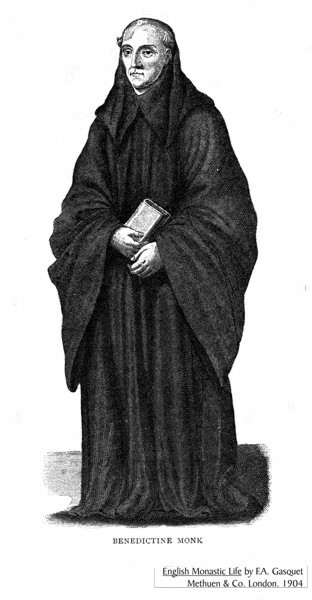 With the advent of the Scottish monks from Iona the system of St. Columba was for a time introduced into the North of England ; but here, as in the rest of Europe, it quickly gave place to the Benedictine code ; and practically during the whole Saxon period this was the only form of monastic life in England. centuries the abbots of Cluny form a dynasty worthy of so lofty a position. The first Cluniac house founded in England was that of Barnstable. This was speedily followed by that of Lewes, a priory set up by William, earl of Warren, in A.D. 1077, eleven years only after the Conquest. The last was that of Stonesgate, in Essex, made almost exactly a century later. On account of their dependence upon the abbot of Cluny, several of the lesser house were suppressed as “alien priories” towards the close of the fourteenth century, and those that remained gradually freed themselves from their obedience to the foreign superior. At the time of the general suppression in the sixteenth century there were thirty-two Cluniac houses ‘ one only, Bermondsey, was an abbey ; the rest were priories, of which the most important was that which had been nearly the first in order of time, Lewes. in the sense of an organized corporation, under the perpetual pre-eminence of the abbot and house of Citeaux, and with yearly Chapters at which all superiors were bound to attend. It was the chief object of the administration to secure absolute uniformity in all things and everywhere. This was obtained by the Chapters, and by their visitations of the abbot of Citeaux, made anywhere and everywhere at will. The Order spread during the first century of its existence with great rapidity. It is said that , by the middle of the twelfth century, Citeaux had five hundred dependencies, and that fifty years later there were more than three times that number. In England the first abbey was founded by King Henry I, at Furness in A.D. 1127 and of the hundred houses existing at the general suppression three-fourths had been founded in the twelfth century. The rest, with the exception of St. Mary Grace, London, established in 1349 by Edward III., were founded in the early part of the thirteenth century. A manner of life of such great austerity naturally did not attract many votaries. It was a special vocation to the few, and it was not until A.D. 1222 that the first house of the Order was established in England, at Hinton, in Somersetshire, but William Langesper. The last foundation was the celebrated Charterhouse of Shene, in Surrey, made by King Henry V. At the time of the general dissolution, there were in all eight English monasteries and about a hundred members. Office. They were known still as canons, or those living under a rule of life like the monks, from the true meaning of κανών, a rule. The common life was in time abandoned in spite of the provisions of several Councils, and then institutions other than Cathedral Chapters became organised upon lines similar to those laid down by Chrodegand, and they became known as Canons Regular. They formed themselves generally on the so-called Rule of St. Augustine, and became known, in England at least, as Augustinian Canons, Premonstratensian Canons, and Gilbertine Canons. in England ; two of the abbeys, Waltham Cross and Cirencester, being governed by mitered abbots. In Ireland they were even more popular and numerous, the number of the houses of canons being put at 223, together with 33 nunneries. The Augustinian priors of Christ Church, and All Hallows, Dublin, and seen other priors of the Order, had seats in the Irish Parliament. The habit of the Order was black, and hence they were frequently known as Black Canons. of Shap. In England, just before the dissolution, there were some thirty-four houses of the Order. The Canons of St. Gilbert of Sempringham are said to have been established in A.D. 1139, although the actual foundation as early as A.D. 1131, others as late as A.D. 1148. St. Gilbert, the founder, was Rector of Sempringham and composed his rule from those of St. Austin and St. Benedict. It was a dual Order, for both men and women ; the former followed ST. Augustine’s code with some additions, whilst the women took the Cistercian recension of the Benedictine Rule. These canons, according to Dugdale, had a black habit with a white cloak and a hood lined with lamb’s wool. The women were in black with a white cap. In the double monasteries the canons and nuns lived in separate houses having no communication. AT first the Order flourished greatly. St. Gilbert in his lifetime founded thirteen houses, nine for men and women and four for men only. In these there are said to have been seven hundred canons and fifteen hundred sisters. The order was under the rule of a general superior, called the master or prior-general. His leave was necessary for the admission of members, and in fact, to initiate business or at least give validity to the proposals of any house. There were, in all, some twenty-six of these establishments in England at the time of the general dissolution. Four only of these were considered as ranking among the greater monasteries whose income was above £200 a year. The Hospitallers began in A.D. 1092 with the building of a hospital for pilgrims at Jerusalem. The original idea of the work of these visiting knights was to provide for the needs of pilgrims visiting the Holy Land and to afford them protection on their way. They, too, followed a rule of life founded upon that of St. Augustine, and their dress was black with a white cross upon it. They came to England very shortly after their foundation, and had a house built for them in London in A.D. 1100. They rose in wealth and importance in the country ; and their head, or grand prior as he was called, became the first lay baron in England, and had a seat in the House of Peers. 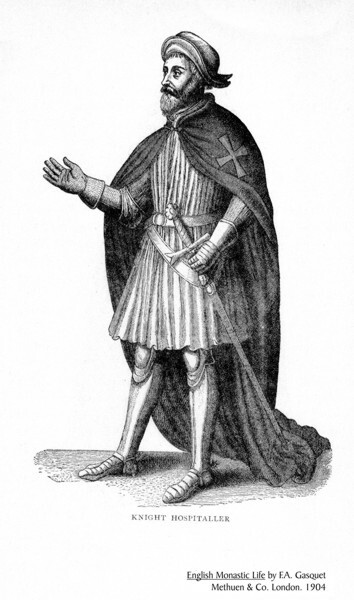 Upon many of their manors and estates the Knights Hospitallers had small establishments name commanderies, which were under the government of one of their number, called the commander. These houses were sometimes known as preceptories, but this was a term more generally used for the establishments of the other great Military Order, known as the Templars. An offshoot of both these orders was known as “The Order of St. Lazarus of Jerusalem.” There were a few houses of this branch in England, which was founded chiefly to assist and support lepers and indigent members of the Military Orders. They are, however, usually regarded as hospitals. The Knights of St. John of Jerusalem had their headquarters at the Hospital of St. John, near Clerkenwell, to which were attached some fifty-three cells or commanderies. 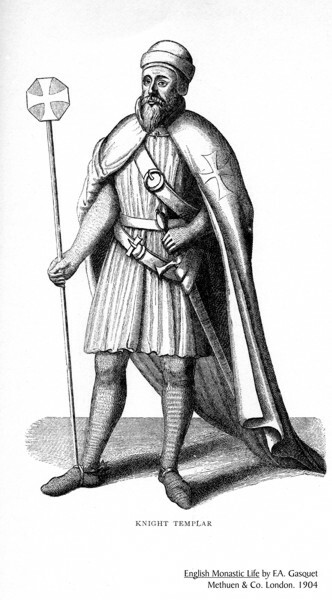 The Military Order of the Templars was founded, according to Tanner, about the year A.D. 1118. They derived their name from the Temple of Jerusalem, and the original purpose of their institute was to secure the roads to Palestine, and protect the holy places. They must have come into England early in the reign of King Stephen, as they had several foundations at this time, the first being that in London which gave its name to the present Temple. They became too right and powerful ; and having been accused of great crimes, their Order was suppressed by Pope Clement V in 1309 : an act which was confirmed in the Council of Vienne in 1312. The head of the Order in England was styled the “Master of the Temple,” and was sometimes, as such, summoned to Parliament. Upon there manors and estates the Templars, like the Hospitallers, frequently built churches and houses, in which some of the brethren lived. These were subordinate to the London house and were in reality cells, under the title of “Preceptories.” On the final suppression of the Order, their lands and houses, to the number of eighteen, were handed over to the Knights of St. John of Jerusalem. One house, Ferriby, in Yorkshire, became a priory of Austin Canons, and four other estates appear to have been confiscated. In all there were some three-and-twenty preceptories connected with the London Temple. of Winchester, in A.D. 1221 and their Order quickly spread. In the first year of their arrival they obtained a foothold in the University of Oxford, and at the time of the general suppression of the religious Orders in the Sixteeth century they had fifty-eight convents in the country. St. Francis the founder of the Grey Friars was contemporary with St. Dominic, and was born at Assisi, in the province of Umbria in Italy, in A.D. 1182. These friars were called Franciscans from their founder ; “Grey Friars” from the colour of their habit ; and “Minorites” from their humble desire to be considered the least of the Orders. Their rule was approved by Innocent III in A.D. 1210 and by the General Council of the Lateran in A.D. 1215. 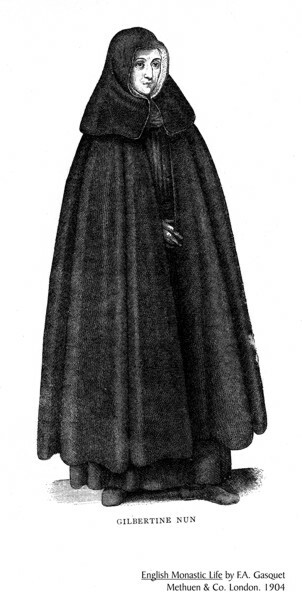 Their dress was made of a course brown cloth with a long pointed hood of the same material, and a short cloak. They girded themselves with a knotted cord and went barefooted. 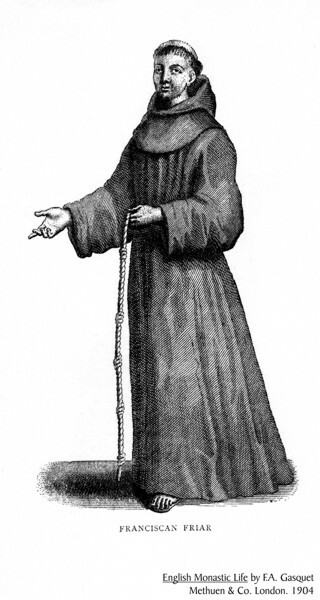 The Franciscan Friars first found their way to England in A.D. 1224, and at the general destruction of Regular life in England in the sixteenth century they had in all about sixty-six establishments. A reformation of the Order to primitive observance was made in the fifteenth century and confirmed by the Council of Constance in A.D. 1414. The branches of the Order with adopted it became known as “Observants” or “Recollects.” This brand of the Order was represented in England by several houses built for them by King Henry VII although they are supposed to have been brought into England in the time of Edward IV. grouped round convenient centres such as London, York, Cambridge, Bristol, Oxford, Newcastle, and Worchester. Harpsfield says that the “Recollects” or “Observants” had six friaries, at Canterbury, Greenwich, Richmond, Southampton, Newark, and Newcastle. The Minoresses were instituted by St. Clare, the sister of St. Francis of Assisi, about A.D. 1212, as the branch of the Franciscan Order for females. The followed the Rule of the Friars Minor and were thus called “Minoresses,” or Nuns of St. Clare, after their foundress. 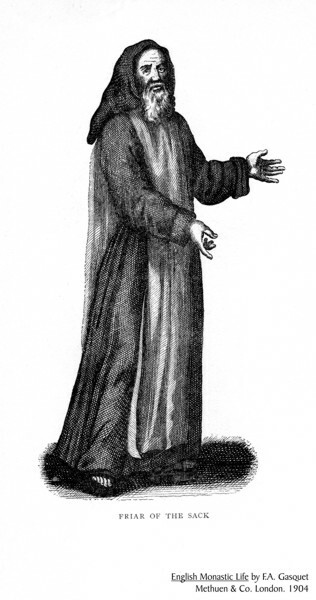 They wore the same dress as the Franciscan Friars, and imitated them in their poverty, fro which cause they were sometimes known as “Poor Clares.” They were brought to England somewhere about A.D. 1293, and established in London, without Aldgate, in the locality now known as the Minories. The Order had two other houses, one at Denney, in Cambridgeshire, in which at the time of the general dissolution there were some twenty-five nuns ; and the other at Brusyard in Suffolk, which was a much smaller establishment. The nuns at Denney had previously been located at Waterbeche for about fifty years, being removed to their new home by Mary, countess of Pembroke, in A.D. 1348.
on that of St. Basil, and was confirmed by Pope Honorius III, in A.D. 1224, and finally approved by Innocent VI, in 1250. They were brought into England by John Vesey and Richard Grey, and established their first houses in the north at Alnwick, and in the south at Ailesford in Kent. At the latter place the first European Chapter of the Order was held in A.D. 1245. In the sixteenth century there were about forty houses in England and Wales. opened a house in London. They had many settlements in France, Spain, and Germany, but lost most of them after the Council of Lyons in A.D. 1274, when Pope Gregory X. suppressed all begging friars with the exception of the four mendicant Orders of Dominicans, Franciscans, Austin Friars, and Carmelites. This did not, however, apply universally, and in England, the Fratres de Sacco remained in existence until the final suppression of the religious Orders in the sixteenth century. 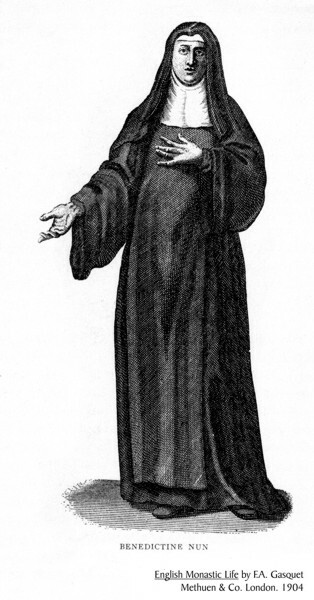 The dress of these friars was apparently made of rough brown cloth, and was not unlike that of the Franciscans ; they had their feet bare and world wooden sandals. Their mode of life was very austere, and they never ate meat and drank only water. These religious were so called from the colours of their habit, which was black and white, like a magpie. They had but one house in England, at Norwich, and had only a brief existence, as the Pied Friars were obliged, by the Council of Lyons, to join one or other of the four great mendicant Orders. Their house, which, according to Blomfield, stood in the north-east corner of the churchyard of St. Peter’s Church, was given to the hospital of Bek, at Billingford in Norfolk. Close Roll of I I Edward II., to show that they were only dissolved in that year, A.D. 1318. The friars of Our Lady are said to have lived under the Rule of St. Austin. They had a white habit, with a black cloak and hood. They were instituted in the thirteenth century, and had a house at Cambridge, near the castle. Before A.D. 1290 they were also settled at Norwich, where they continued until the great Pestilence in 1349, of which they all died. named ‘”minister,” and included in his office the functions of superior and procurator ; and the houses were united into a congregation under a Minister major, who held a general Chapter annually for the regulation of defects and the discussion of common interests. 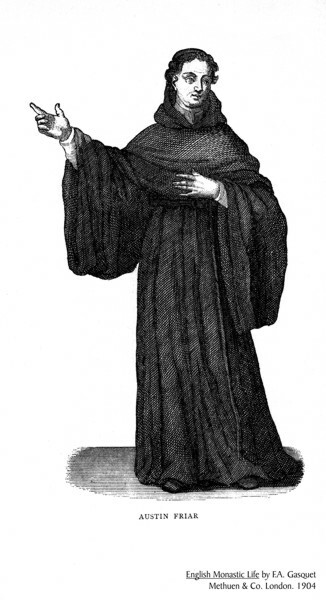 The Crossed Friars are said by some to have taken their origin in the Low Countries, by others to have come from Italy in very early times, having been instituted or reformed by one Gerard, prior of St. Maria di Morella at Bologna. In 1169 Pope Alexander III. took them under his protection and gave them a fixed rule of life. These friars first came to England in the year 1244. Matthew Paris, writing of that time, says that they appeared before a synod held by the bishop of Rochester, each carrying a stick upon which was a cross. They presented documents from the pope and asked to be allowed to make foundations of their fraternity in England. Clement Reyner put their first establishment in this country at Reigate, in 1245, and their second in London in 1249. This last is the better known, as it has given the name of Crutched Friars to a locality in the city of London. The friars had a third house at Oxford, and altogether there were six or seven English friaries. Besides the cross upon their staves, from which they originally took their name, the friars had a red cloth cross upon the breasts of their habits. be considered to have had their beginning in this country. Matthew Paris says that in the year 1257 they were given a house at Cambridge, in Trumpington Street. He describes their dress as being very like that of the Dominicans, from which it was distinguished only by having a red star, or five points with a round blue centre, on the scapular. This badge recalled the meaning of their name, representing as it did the star which led the Magi to Bethlehem. These friars were apparently of English Origin. Some have thought that they were the same as the “Friars of the Sack,” but this is by no means clear. Polydore Vergil says that Edmund of Cornwall, the brother of Henry III., on his return from Germany in A.D. 1257, built and endowed a fine monastery at Ashridge. This he gave “to a new order of men, never before known in England, called Boni Homines, the Bonshommes. They followed the rule of St. Augustine, wearing a blue-coloured dress of a form similar to that of the Augustinian Hermits.” The only other house possessed by the Bonshommes was at Edingdon.